7 out of 7 (100%) reviewers said they would recommend this vehicle to a friend. Was driving a Jazz and changed to the Shuttle. Overall very happy with the purchase at this price point. Great boot space and layout of interior is comfortable for tall people like me (over 1.8m). Overall very roomy interior for this car. Exterior looks good - cool styling without looking too tacky. Decent features like keyless entry and start stop, auto headlights and climate control. Missing cruise control and rear air con but I guess they will be a stretch at this price. Pick up is surprisingly smooth - wasn't expecting the 1.5L engine to go off and rev up that comfortably. Enjoyable driving experience. Body roll is still quite evident so have to be careful. Road noise is also a little loud inside the cabin. Not ear shattering but it's reaching the point of irritation. Overall a very decent car with no deal breakers. Happy that I bought it. As an ex-owner of Honda Civic ES5, Subaru Impreza, and Honda Fit, this car is by far the most impressive car that I've owned. Was considering Jazz (AD), vs Shuttle (PI), as they were similarly priced. Took a risk and opted for Shuttle, and I've not regretted since! Over the years, Honda has improved its build quality. It is evident when I observed the interior, workmanship, and opening/closing of the door. At 130bhp, it's pickup is impressive. On an angled slope, it does not roll back, unlike my Honda Fit. Drive is smooth, although the engine could be a tad noisy if I were to rev it up a bit. Not the quietest ride around, but the road noise is still acceptable. Fussy owners may wish to do soundproofing. I hope the CVT gearbox issues that was prevalent in Airwave and Fit is history. Suspension is not the best, but still bearable. As for front seats, the front passenger seat floor is slightly tilted up. For those who wish to stretch their legs all the way may find it slightly uncomfortable. No issues for driver as I find it quite comfortable. Generous headroom. Sufficient headroom and legroom for rear passengers. Good space for elderly and small children to board. I noticed HRV/Vezel's wheel arch eats into the door space, and the ride is too high. Both resulted in difficult for elderly/kids to get in the car. There's a lot of boot space for a stroller, car seat (when not in use), and bags of groceries. With rear seats folded down, I can even load items as long as 1.8m! - Suspension can be better. - Soundproofing can be better. - Auto door lock not included. I changed my 8 years oldd Latio to shuttle. The most notable difference is the power & the generous boot space. Before hand, I did survey for Grace,Vezel, Shuttle & eventually finalized with Shuttle. As a family car, this kiddo really fulfilled what I derised most on the space as well as F/C. as for the 130bhp, fast pickup and easily hit 100km/hr seamlessly due to the stability. And the handling is as good as the Latio without any problem for me to adapt with change of new ride. The the boot space can cater for a baby pram, baby car seat, two storage boxes. And after running in for 2000km, average F/C is between 13~15km/L when I turn on ECON mode based on around 30% Expressway. This is about 30% To 50% Better F/C than my old Latio. 2. Rear window easy get dirty and won't washed off due to blocked by the rear spolier. 3. A/C touch panel, it's stylish but my boy with keep playing with this. 5. Does't come with cruise control. I drove a Latio Sports for 7 years and then a kiddo came along.. The generous boot space I used to have was suddenly eaten up by pram, 36 pack diaper and milk powders.. Honda Shuttle gave me ample amount of boot space and lots of power for a 1.5L engine too.. Honda Jazz, Vezel and Shuttle all shares the same engine; As a family man, Shuttle gave me the best value for money. Certainly, not without complain, but even if I do state a few, I am keenly aware that if I pay for a 1.5L Honda, I shouldn't expect to get the bells and whistles of a 2.0L Audi/BMW. - Sound proofing could be improved but bearable to me. - Front center panel only has one 12V outlet (come on, Honda Japan!). - Car paint is on the thin side esp. compare to my Latio. Handsome exterior design. Good handling..stable ride..roomy space..center console..
Engine and wind noise bit loud..a bit jerky during low speed..feel some Vibration from brake pedal and seat during car idle..I think Honda have to put more NVH effort for their earth dream engine.. I have been driving this car for a week now, and I must say that I am a proud owner of a Honda Shuttle. Comfort : Although can be subjective, personally I feel that this car has comfort. Both for driver and front passager. Even for the back passengers. I am a tall person at 1.8m and after adjusting the driver seat to my comfort zone, the passenger at the back (which is me when I tested) still has enough legroom to cross your leg. Handling: Has traction control and allows better traction especially on wet roads in our tropical country. Exterior styling: Sleek for a station wagon. Interior design: Acceptable for the common man. If you require more futuristic gadgetry than probably you need to spend a few more Ks on other makes. Other than that, being a new car, all is good and dandy. Let it last! A spacious station wagon, big enough to fit in my road bike without having to take out the front wheel with knockdown real seat. Suitable for family outing and shopping. It feel like a car but can use as a van with seat down. Feel like driving a big cc car. Good legroom for front and back. Not too common as Vxzxl. Aircon not as cold as my previous Altis. 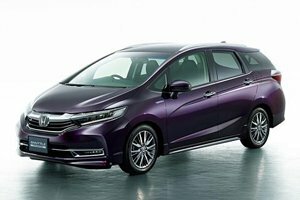 Authorised Distributor Honda cars are Honda City Reviews, Honda Civic Reviews, Honda Civic Type-R Reviews, Honda CR-V Reviews, Honda HR-V Reviews, Honda Jazz Reviews, Honda NSX Hybrid Reviews, Honda Odyssey Reviews. Parallel Imported Honda cars are Honda Civic Hatchback Reviews, Honda Civic Type-R Reviews, Honda Fit Reviews, Honda Fit Hybrid Reviews, Honda Fit Hybrid Speedo Motoring Edition Reviews, Honda Fit Speedo Motoring Edition Reviews, Honda Fit Trust Motoring Edition Reviews, Honda Freed Reviews, Honda Freed Hybrid Reviews, Honda Freed Hybrid Trust Motoring Edition Reviews, Honda Grace Hybrid Reviews, Honda Odyssey Reviews, Honda Odyssey Hybrid Reviews, Honda Shuttle Reviews, Honda Shuttle Hybrid Reviews, Honda Shuttle Hybrid Speedo Motoring Edition Reviews, Honda Stepwagon Reviews, Honda Stepwagon Hybrid Reviews, Honda Vezel Reviews, Honda Vezel Hybrid Reviews, Honda Vezel Trust Motoring Edition Reviews. sgCarMart is the number one car site for buying Singapore cars, including new cars, parallel import cars, Toyota, Honda, Nissan, Volkswagen, Mitsubishi & BMW. We have new car dealers comprising parallel importers, authorised car distributors, and used car dealers who have the New Honda Shuttle Trust Motoring Edition latest price Find new car pricelists, new car launches, new car promotions, new car reviews, latest car news & car articles. Read the New.Honda Shuttle Trust Motoring Edition consumer reviews to help you decide on buying a car. Also join our car discussion and forum discussion for car reviews, motoring news & motoring guides. Visit our partner sites who have job openings for Singapore jobs, Singapore classifieds, mover and real estate properties for sale.